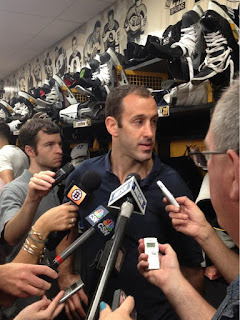 The Boston Globe’s Fluto Shinzawa tweeted that the Bruins Jay Pandolfo is leaning toward retirement. The former Terrier captain played 18 regular season games for Boston, but none in the playoffs. The 38- year-old winger skated for the Terrier’s NCAA championship team in 1995 and played in the Frozen Four all four years at BU. In 1996, he scored 38 goals and 29 assists, earning Hockey East Player of the Year honors and was runner up for Hobey Baker Award. In the NHL, Pandolfo has played 899 regular season games, scoring 100 goals. He also played 131 playoff games all with the Devils, winning the Stanley Cup in 200 and 2003. Former Terrier defenseman Adam Clendening was recalled to Chicago after AHL Rockford’s season ended, but didn’t play in any Stanley Cup games. Another BU connection to the Stanley Cup champions is Director of Amateur Scouting Mark Kelley, whose father Jack Kelley was an All-East defenseman at BU and later spent ten seasons as head coach, leading the Terriers to back-to-back NCAA titles in 1971 and 1972. Former BU All-American Kevin Shattenkirk signed a four-year $17 million extension with St. Louis. Last season, the former Colorado 2007 first-round draft pick scored five goals and 18 assists for the Blues. Colby Cohen, also a former Avs pick in 2007, has signed on with the Ässät Aces in the Finnish elite league, SM-liiga. Cohen spent most of last season with Providence Bruins, but missed numerous games due to injury. In 2009-10, his final season at BU , Cohen was named to the Hockey East First Star team and the NCAA East First All-American Team as he led the teams defense with 30 points in 36 games, scoring 14 goals which were the most scored in a single season by a BU defenseman in over 30 years. Cohen and 2013 graduate Ben Rosen are on the U.S. hockey roster for the 2013 Maccabi Games in Israel, beginning July 17. Former BU captain Sean Sullivan has signed a contract for 2013-14 with Modo of the Swedish Elite League. A Hockey East first team all-star in his 2006-07 senior season, Sullivan played for AHL Lake Erie last season after previous stints in the Phoenix, San Jose and Florida systems. In 2009-10, he made the AHL All-Star game and scored 49 points. Corey Trivino was acquired by the ECHL Stockton Thunder from the Florida Everblades. The former Terrier was Florida’s top rookie scorer with 51 points, third best overall on the team. The trade completed a March 2013 transaction the brought goalie Cody Reichard to the Everblade. There’s a bit of irony here since Reichard was the goalie for Miami in BU’s 4-3 OT win in the 2009 national championship game and it was Trivino’s forecheck on a Redhawks defenseman that freed up the puck, which eventually reached Colby Cohen, whose deflected slap shot looped over Reichard’s shoulder for the title-winning goal. Former Terrier standout Shawn Bates, who recently was named head hockey coach of his high school alma mater, Medford High, put his other athletic talents on display at the Mass. D1 North Quarterfinal baseball game, throwing out the first pitch. Bates, who scored 144 points in his four years at BU before beginning a long NHL career, was a star pitcher and shortstop for the Mustangs as well as an All-Scholastic hockey player.